The National Park System has programs for 4-5 year olds to earn Mini-Junior Park Ranger badges at their parks. 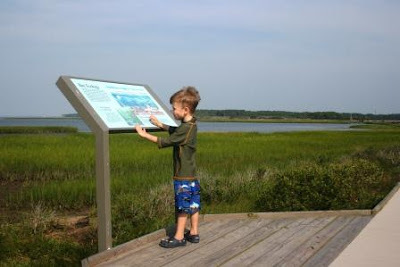 Pierce decided he wanted to try to earn one for Assateague. We picked up our booklet and then did some beach explorations for ghost crab trails, plus smells and sights on the beach. Pierce drew a really cute pictures of the dolphins we saw swimming in the surf one morning. Then we went to attend a program called Assateague Detectives. 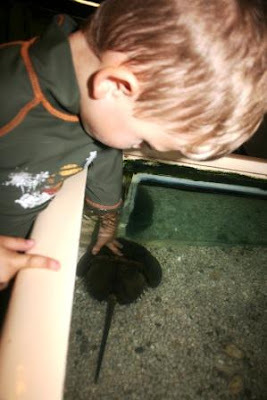 While we waited for the program at the Tom's Cove Visitor Center to begin, Pierce played with the horseshoe crabs. 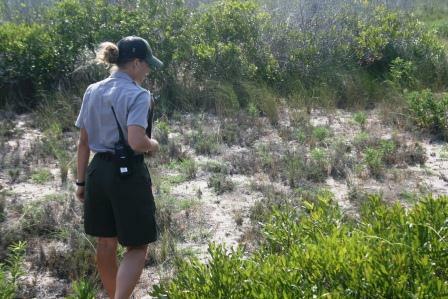 Ranger Jenny showed us around the marshes, and taught us how to look for clues as Assateague Detectives. 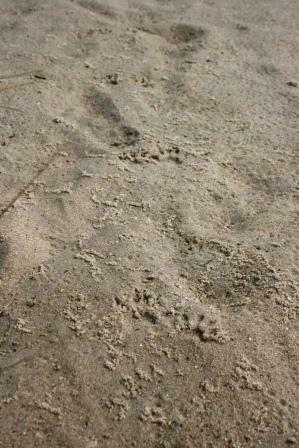 We found fiddler crabs and many different kinds of tracks. 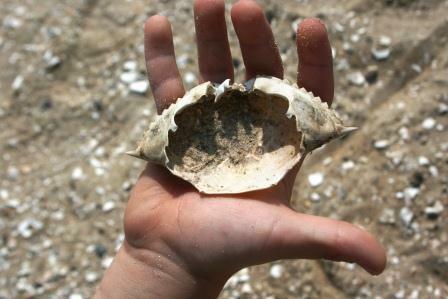 This shell is from a blue crab. Ranger Jenny told us that they are much more blue when they are fresh, but when they are empty from the seagulls or other animals that eat them, they become lighter. Can you spot the trail of raccoon tracks in this picture? We found lots of evidence of raccoon activity around the marshes. 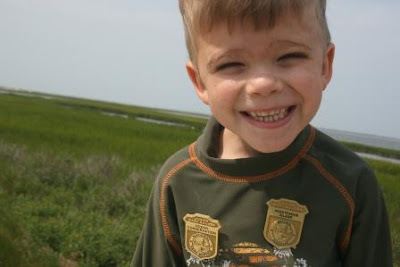 Pierce earned his Junior Park Ranger badge for completing the program, and he also earned an Ocean Conservation badge for participating in Assateague Detectives. He took an oath to protect the island and its wildlife and land, and he takes his duties seriously! I present to you...Junior Park Ranger Pierce! Wow! Very cool program! I will have to see what is available in my area. I think we have a couple national parks in Maine, but they are much farther north than I.
LOL How cute. Congratulations Pierce. That is such a great way for the Parks to make kids feel important. Yay pierce! ! Way to go! Looks like fun! Wow! I love the badges! We salute you mini-junior park ranger Pierce, well done young sir! That is great - what a lovely way to get him inspired to take care of and protect the nature. Have a great day! Great programs! Congratulations, Ranger Pierce. Well done! What a great program and a fun way to spend the day! Yay, Pierce! Good job, Pierce! What a great program. Congratulations Pierce I have no doubt you are going to be a great Ranger. Congratulations to Pierce for a job well-done. The programs sound great--a great way to learn about the environment and its inhabitants and to foster a caring attitude towards them. Amy always had fun earning those badges too! They are great programs! Great job, happy smiling, Pierce. That's a super program. Love the raccoon tracks. what a geat smile and a proud fellow!! i really like programs like this!! Now that is a fun program. So glad he got such joy out of it! Awesome job Pierce! Not only should you be proud but you have one amazing smile! You are going to make a great ranger in the future! Pd what a great program! Congratulations Junior Ranger Pierce!! That's a mighty handsome smile. The best part of this is that we get to teach our young and pass it on:) Plus kids make the best birders on a hike. They have way better eyes than the adults. That's the cutest little park ranger. What a fun educational activity! for my guide! What a cutie. Such a cutie! He looks proud! I love the idea of taking an oath. That is pretty serious business! That is such a wonderful program. Congratulations you must be so proud. fabulous learning opportunity! good for him...good for you!! There are many at state and county level offered as well.I enjoy youngsters at my presentations. That last photo is priceless! What a million dollar smile! WOW Pierce rocks! How fun! He is just the cutest kid ever! !